Honoring the history and heritage of the region, the Adams County Board of Commissioners announced Riverdale Animal Shelter as the name of the county's new facility scheduled to begin construction in 2018. Work on the site for the new Riverdale Animal Shelter started June 11 and will continue through the end of August 2018. The work is related to the new water well for the new shelter and involves drilling. This will include a TEMPORARY road from Riverdale to the new animal shelter site. The temporary road will be paved to allow heavy equipment to access the site. A temporary paved road from Riverdale Rd. to the new Riverdale Animal Shelter site is being put in place to provide access for heavy equipment. Previously, a permanent road from Riverdale Rd. to the new shelter was included in the plan; however, this road is no longer required for the project. So, we are happy to report the temporary road from Riverdale Rd. will be removed once the necessary site work is completed for the new shelter. What do we do at our current shelter? The Adams County Animal Shelter/Adoption Center (ACASAC) takes in nearly 6,000 stray, abandoned, and neglected animals per year, and provides thousands more with vaccinations and microchips. We save lives by treating injured and ill animals, reuniting lost pets with their guardians, and serving as the place many Adams County residents come to adopt their pets. ACASAC also plays an important role in public health and safety. In addition to vaccinating animals against disease, we work closely with the local health department and six municipalities within Adams County providing quarantine and holding services, including those for animals involved in hoarding situations. We also serve as a critical facility responsible for providing temporary shelter for animals in our community, should they become displaced due to an emergency or disaster. As the county’s population continues to grow, so does its animal welfare needs. From lack of adequate kennel spaces and public parking, to an undersized health clinic that limits the number and types of procedures our veterinary team can perform, the county's animal care needs have simply outpaced the ability of our facility. The current shelter, which was retrofitted from an existing warehouse, is rapidly falling out of line with modern animal sheltering standards. Lastly, the current shelter is located in an industrial area alongside railroad tracks, which is a dangerous environment for our animals, staff, and customers. Limited visibility to the public is a constant issue, and the absence of any green space or sidewalks makes walking dogs in this area unsafe. The old days of stark and dreary pound-type structures have given way to visually attractive, well-designed, maintainable facilities, allowing for excellence in animal sheltering and an array of services to support and engage residents. The new Riverdale Animal Shelter will be more than 43,000 square feet. The state-of-the-art facility will have ample and modernized kennel spaces for cats and dogs, and additional housing for small mammals and exotics. The expanded health clinic, improved noise abatement, and disease containment features will significantly decrease stress and illness for shelter animals and make for a better visitor experience. Additional public parking, private adoption rooms, and a dedicated lost and found lobby will help streamline the adoption process and improve efforts to reunite more lost pets with their families. To better serve our community, a large multipurpose room will allow for more frequent public vaccination clinics, behavior support for new adopters, and humane education programs for youth to learn more about animal safety and care. Where will the shelter be located? 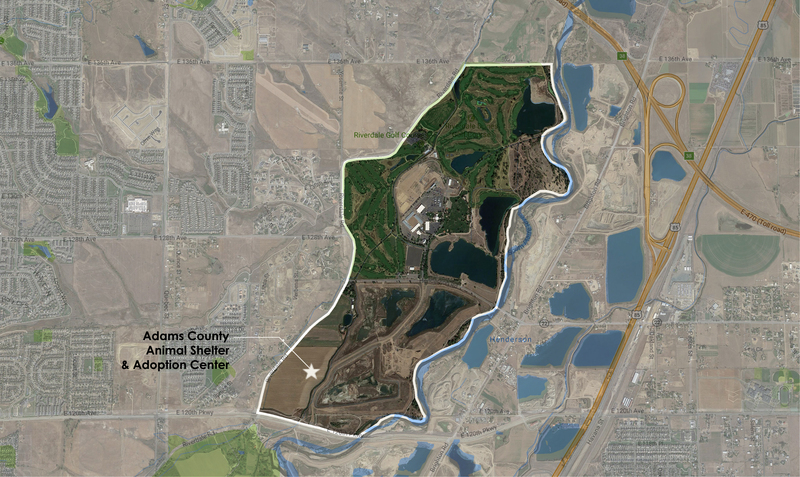 The new shelter will be located on the south end of the Adams County Regional Park between E. 120th Parkway and Henderson Road. Have questions? Please email us at animal-shelter@adcogov.org.